A fantastic view of some trees and buildings at Balboa Park in San Diego with a purple flower garden in the foreground. 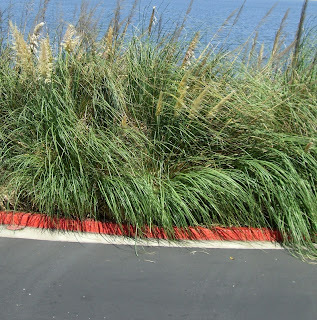 This is a view of reeds along the San Diego Bay with that red California curb that's so noticeable to anyone that takes the time to look. I saw this colorful view out of the stairway of our hotel backdoor on our recent trip to San Diego.